The Great Depression refers to a worldwide dip in the economy that was felt in the 1930s and lasted for more than a decade. It is believed to have originated from the famous business center in New York known as the Wall Street (Burg, 39), and then spread to the entire world. The government of the United States having ignored predictions by economists questioning the governments’ regulation of the investment and budgeting process, went ahead to put up policies that led to a high speculation in the economy. This coupled with the fact that the Investment market by then was ill regulated created loopholes in the policies could not contain the market excitement, which led to overoptimistic loan agreements between banks and investors oblivious of the warning indicators highlighted by the economists (Berton, 130). Therefore, financial information became highly versatile and gambling was rampant. It was not long before the true financial value of companies started reflecting due to unrealistic profits posted by the general production industry yet there was no cash flow to support their continuity in daily production. These created a huge gap between available resources and the money reflected that was in fact non-existent. The economy gradually deteriorated over a long period of time thus the term “Great Depression”. This period was characterized by shrinking and closing down of businesses, unemployment, poverty and drop in higher education learning, low profits and losses among other reasons (Rothbard, 80-84). The Great Depression majorly affected companies and factories especially in the manufacturing industry, plantation farming for raw materials and the mining industry. The main pointers to individual citizen impacts was a reduction in consumer spending and general fall in confidence of the said citizens in United states and the rest of the world. There has been no clear explanation of the causes of this Economic Phenomenon to date but a variety of possible stimuli have been forwarded which include; High consumer debt, not well regulated investment markets, insufficient growth in industrialization to match with production demands and general wealth inequality in the societies (Berton,235). All these theories have been analyzed over time and two wide classification groups were made. The first one approaches the topic from the perspective of the macroeconomic effects of supply and demand in the economy. These directly touch on industrialization through massive production of goods and the relationship with the level of consumption prevalent by then, in the economy. The second category leans more on institutional regulation in terms of available structures and guidelines governing the then, trade and commerce in terms of production and consumption. This category highlights the effect of excitement in investment and the existence of weak policies by the government to control and regulate the banks versus investors’ relationship in the stock and share market. In simpler terms the basis of investment during this period was purely speculative. The final impact was greatly bourn by the citizens because as a direct result of the Great Depression, the rate of unemployment shot up and the employees laid of with minimal compensation got engulfed in the speculative atmosphere to take part in the share market by then. The promise of a boom could be resisted by few unemployed citizens. There was a sharp fall in the birth rates among the Americans couples preferred not to give birth to more children as the cost of living had greatly increased with shortage in their daily income. This made it difficult to maintain a large family among the couples. This eventually led to many of the people opting to live a single life in order to minimize cost of living in the society. The depression in the income led to high rates of decrease in the marriages as the cases of divorce were incurred on daily basis. 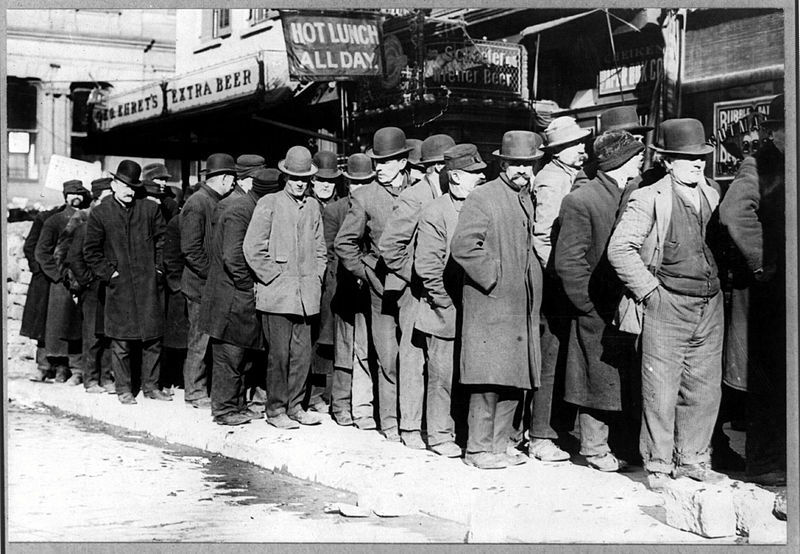 Most of the daily economic activities were put on a stand still as the country underwent total economic hardship during the entire great depression period (Mac Elvaine, 99-104). The social ethics in the society were violated as there was increase in ant-social vices like robbery, prostitution, corruption and theft that was mainly viewed as the only alternative of getting a fast source of income among the youth and other people in the society. With the increased rate of unemployment among the youth as many of them had lost their previous jobs due to the economic state resulted to increased rates of crimes across the country as they struggled on using all the means to acquire food. This led to increased rates of robbery that led to even death as some people were killed in the process. Most of the children incurred the malnutrition problems, while women opted for prostitution in order to pay their daily bills incurred. The health care services were not available as the only doctors around were preserved for the rich who could afford to meet the cost. Access to the higher learning institutions was greatly affected as most of the people were unable to meet the requirements to enable them to access the education due to the economic situation in America (Schultz, 40). The government spending on institutions decreased sharply forcing some of the institutions to close down due to lack of finances in maintaining the running of the schools. The number of women in schools decreased to an alarming rate compared to that of men as men had hopes of getting an opportunity in the market compared to woman. There was an increased in the demographic trends in the entire society as the people strived to meet their daily basic needs using all the available means. There were delays in marriages among the people as the youth were expected to take care of their parents before opting to move out into marriage. The birth rates fell stridently during the lowest points of the Depression as many Americans learned about birth control measures to avoid the added expenses of unexpected children in the family (Rothbard, 159-154). There was also increase in the number of immigration from the rural areas to the urban areas (Rural New England and upstate New York) in search of job opportunities. People moved from the Great Plains to cities like California and Arizona. Majority of the migrants were adolescents seeking opportunity away from their family that had younger mouths to feed (Burg, 39). The Great Depression had monotonous effects on the American society such as many citizens were drowned to poverty making more than 18000 citizens to commit suicide in 1931. This affected many bread winners of different families and never the less the former millionaires had no option but to sell one apple at five cents rendering the citizens helpless. This effect made less money to flow with the American citizens in turn affecting the economy negatively setting it on a downward throat (Schultz, 35). With the effects on the economy the government could not escape being affected. The government expanded as a result of many rising political parties assuring the citizens to have solutions for the crisis, this crippled many able political parties because of them dividing to form other weak parties instead joining together to form an extremely strong party. The breaking up of parties had also another positive part in that new government policies dealing with social security, welfare and unemployment insurance were formed (Mac Elvaine, 300). However, despite all the ups and downs, people were brought together while watching films like “The Bride of Frankenstein” in 1935 and Frankenstein. Their cultures were maintained through watching such movies that gave them hope. In conclusion, the Great Depression was a major learning point for the global market. This was a key pointer of how one trade point can influence the trends in the world due to globalization. Due to the Great Depression, the world had to form a unified front and have constant forums to date addressing economical issues as one so as to get a solution not only for a specific affected community but any other country that has substantial interests in trade and other commercial related activities with the country at the center of any economical crisis. The Great depression led to a surge in trade unions not only within countries but global partnership became a key indicator of the new commercial relationships. The Great Depression made the individual citizens to take a keen interest in government policies and actively participation in formulation of the same. Citizens became aware of their important roles in the countries budget and investment policies. Investors in the share market had to take a keener look at regulations and pushed for amendments and adjustments. In other words, the citizens took the watch dog role seriously because they realized that it all starts by them and will end with them. The Great Depression however had a positive impact because it developed a new crop of private entrepreneurs who exercised innovative and creative ideas to survive and stay relevant throughout the Great depression. The great depression can be credited with developing strong world Trade and commerce bonds thus, it should be termed as the genesis of world trade ties that placed politics in the second position of international relationship. In other words, political decisions were now made after careful consideration of implications on the economy.